You know Kim and I like to try different coffees and that we like decaf in the afternoon. 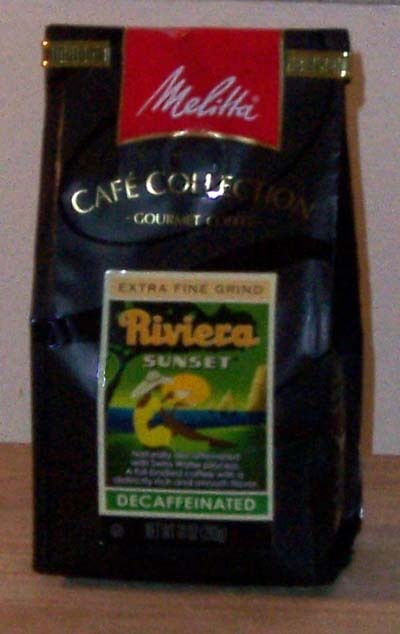 We look forward to the brewing, tasting and reviewing; so we were looking forward to trying this Riviera Sunset. It is part of Melitta’s Café Collection. It is described as a Swisss Water process decaf with a full body and a distinctly rich and smooth flavor. It also came in an extra fine grind so we would not be brewing in the French Press. First up was the auto-drip and when I opened the bag there was not much aroma. I even stirred the grounds with the coffee scoop to try to get some aroma, no luck. I’ll make coffee some times without telling Kim what it is so she can think through and ask me questions about it. This helps both of us learn more about coffee tasting. There was hardly any conversation. We just drank the coffee. It does have a faint citrus taste and is very smooth. It is not bold at all. Two thumbs down and this is a first for us. Next day I brewed the coffee in the Chemex. There still is not much aroma. I stirred the bag again and we both tried to smell the grounds, but no help. We noticed we really miss the aroma and it does help set up the brewing and tasting of the coffee. There was a better flavor with the Chemex and we thought there was a slight lemon taste. There definitely was a light citrus flavor. The coffee has a weak body and hardly any aftertaste. To us it isn’t like it was described. Two thumbs down, but better than the auto-drip. Not being used to negative reviews I brewed it in the auto-drip a second time and we discussed the taste. As we talked with each other about the aroma, flavor, body and aftertaste it hit me. This Riviera Sunset is not memorable. There is nothing that stands out to me to make me dwell on it or want to go out and buy it or share it with friends. That being said we still enjoyed the coffee tasting experience and look forward to our next review. We received this coffee for free and offer objective feedback. In all fairness we are used to whole bean and grinding our coffee before brewing. We also like the French Press and the way it brings out flavors. It’s not like I wouldn’t drink it again and I am visiting my in-laws and I know they will drink decaf! Ah, the joys of coffee!